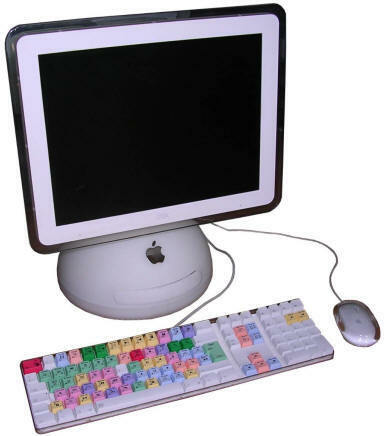 Although using flat panels in desktop Macs was tried earlier (in 20th anniversary Mac), in more popular models Apple decided to make use of it in 2002 iMac. As always it was stylish - hemispherical base contained all internals while 15-inch flat panel was mounted on easily adjustable jointed shaft. This made them look like desk lamps, making these Macs known as "desk lamp" iMacs. The move from CRT displays in Macs has started. And comparing to earlier MAcs, this panel has good quality of picture. Inside, the first model had a 700MHz PowerPC G4 CPU and 256MB of RAM mounted in non-user-replaceable DIMM, while additional RAM could be added with SODIMM. 40GB hard drive was sufficient for most tasks, yet this Mac had FireWire to add more space with fast external FireWire disks. Optical drive could be CD-RW or, in more popular variation, a CD-RW/DVD-ROM drive called "SuperDrive". 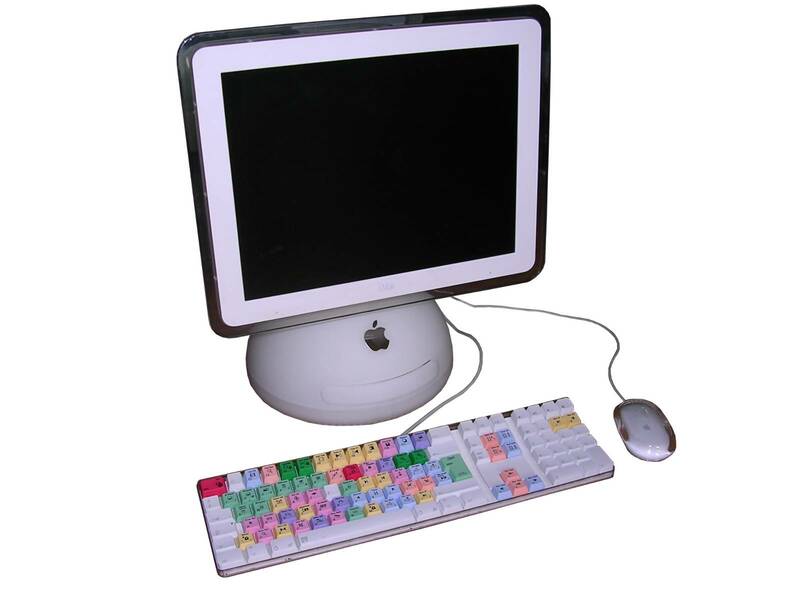 These sets were usually sold with white keyboard/mouse and small spherical speakers. Unfortunately the design made these Macs very fragile, and today it's not easy to spot a working one. My unit has been used in office in Germany, first with Mac OS X, then with Ubuntu Linux, until 2010. During its using period it was upgraded with 160GB Samsung drive and got another 256MB of RAM - to make 512MB. It was probably imported with other computers. Despite few scratches it is in working condition. I removed Linux and installed back 10.3, updated to 10.3.8 with Polish patch. This particular computer has very specific design. The mainboard is on the bottom while the heatsinks with fan are on the top, and between there is a drives cage, power supply unit and its subcircuits. The problem is that the whole heat from CPU is transmitted to heatsink/fan assembly on top of hemisphere by a single heat pipe. More, because mainboard is mounted to bottom part of hemisphere, the heat pipe is in fact two heat pipes which are pressed together when bottom part is fastened. There must be a decent amount of good thermal compound between them and service manual instructs to replace it every time the case is opened. Any air bubble in this junction dramatically decreases cooling efficiency and makes machine run hotter. So although it is possible to overclock CPU (see links), it is definitely not recommended to do so. Not because CPU can't, it's because cooling can't stand excessive heat. This is not an easily-overclockable eMac with heatsink-augmented heat pipe and a big fan to blow the air through it. Problems with maintaining proper heat exchange in pipes junction was the main factor why working "desk lamp" iMacs are so rare today. http://faqintosh.com/risorse/en/guides/hw/imac/g417hd/ - Upgrade RAM and disk drive in 17-inch flat panel iMac. http://www.thundernerd.com/iMacG4Chart.html - Overclocking G4 iMac. Theoretical information. READ MY NOTES before doing it.